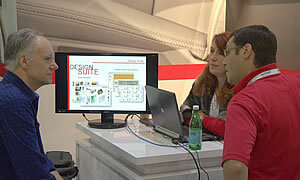 Lectra showing its CAD/CAM software at the show. Nearshoring is replacing outsourcing, as a large percentage of apparel imports are coming back to the U.S., and "Made in America" products are once again gaining strength. "The buzz and energy was extraordinary on the show floor," stated Dennis Smith, president, Messe Frankfurt North America. "We are proud to take this event to the next level, as we better serve the U.S. sewn products industry, the 'Made in America' manufacturers, and the technical textile industry." "Made in America" continues to gain momentum. An important reason comes from the use of robotics, as well as the significant progress made to improve efficiencies within the production equipment category by innovative supply chain textile and apparel processing manufacturers. .
Lectra is a pioneer and world leader in integrated technology solutions (i.e. software, CAD/CAM equipment, and associated services) for fabrics, leather, technical textiles, and composite materials for manufacturing textile products. 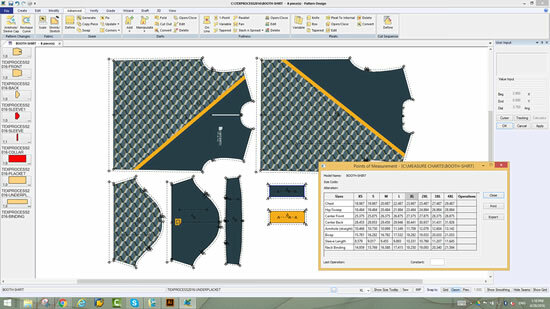 At Texprocess America, Lectra showcased its CAD software for creating wovens, knits, and prints, while training future fashion and apparel professionals attending the show. Lectra also highlighted its Vector® iXM cutter with cutting. Cutting demos at the show, which included: 1) Apparel Industry solutions for the planning, design, development, and sourcing features that create fast, accurate cutting; 2) Auto Industry fabric-cutting solutions that help companies remain competitive and manage the complexity and flexibility associated with efficient manufacturing of car seats and interiors, while offering greater choice in colors, styles and models; and 3) Furniture Industry solutions that many companies use for made-to-order manufacturing. Lectra's single-ply cutter solutions provide the flexibility, reliability and critical productivity, while offering more customized production in smaller volumes. Leister Technologies, a worldwide leader in plastic welding and hot air equipment, showcased its welding machine and NOVOLAS TTS (Table Top Laser System). Leister's innovative and flexible patented laser bonding solutions provide an alternative production process for automotive, medical, sensor, electronics and textile manufacturing. The NOVOLAS TTS laser unit and processing cell can be set up separately from one another, which optimizes space in production. 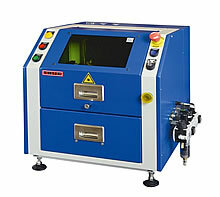 The compact manual workstation combines all of the advantages of the laser welding in an inexpensive and simple programmable system. Datacolor®, a global leader in color management testing equipment and color communication technology, launched its Datacolor® Family of Benchtop Spectrophotometers (800, 500, 200 series) with its embedded processor and data storage. This cost effective and accurate color measurement system provides textile/apparel manufacturers a platform for increased efficiency and color confidence in delivering an economical and performance solution. to specify, formulate and control color reflectance and transmission. "The color testing equipment shows color changes in different lights, and helps the user make a color decision," explains Reid Oshiro, product manager for Datacolor's industrial products. "Retailers use the equipment to ensure color consistency." Gerber Technology, the world leader in integrated software and automation solutions for the apparel and industrial markets, showcased its Digital Solutions at the Texprocess Americas show. Gerber demonstrated how AccuMark software integrated with Gerber's ContourVisionâ„¢ and the GERBERcutter Z1 can execute scan-to-cut operations. Gerber showed each step of its Digital Solutions to illustrate how companies can network their software and smart machines to form an end-to-end solution to help meet the workflow challenges of mass production and mass customization. "Regardless, if you're producing 10,000 shirts a day or personalizing jerseys for a sports team, the key to success is a digitized network that allows you to move information throughout your supply chain down to the equipment level and back," said Mike Elia, CEO of Gerber Technology. "Integrating the flow of data and leveraging IoT technology provides companies with the valuable insight they need to remain agile and optimize their supply chain."